The war memorial near to Beighton parish church (St Mary the Virgin, Church Lane). The names are: Sgt. H Taylor RAF, Sgt. 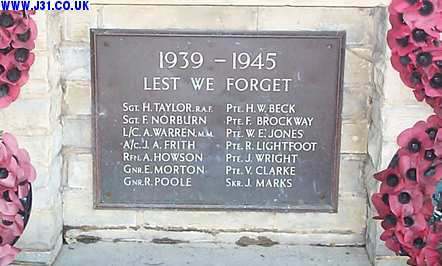 F Norburn, L/C A Warren MM, A/c J A Frith, Gnr E Morton, Gnr R Poole, Pte H W Beck, Pte F Brockway, Pte W E Jones, Pte R Lightfoot, Pte J Wright, Pte V Clarke, Skr J Marks.